1: Loveshackfancy Pastel Fairisle Sweater: Just so perfect- the crop, the shoulder button detail, and the overall shape is that perfect mix of flattering but cozy. I adore the pastel palette, too. 2: Adidas Originals Sneaker: The fact that sneakers are acceptable footwear basically 24/7 is maybe the best thing to ever happen in women’s fashion, as far as I am concerned. While I can’t do the all out “Dad Sneaker” trend, I can for sure get on board with a slightly chunky sole in a retro sneaker, especially when said sneaker is pale pink. 3: MOTHER Puff-Fur Snap Jacket: Clearly I am having a retro moment this season. Navy blue, ivory faux fur- and the ringed banding at the wrists and waists? LOVE. 4: Rebecca Minkoff Stargazing Earrings: I have a thing for stars on my accessories- my favorite Golden Goose sneakers, these new workout leggings from my favorite activewear brand, everyday whimsical earrings I got for less than $15 from this secret source. The oversized sparkly earring trend (ideally paired with super casual basics) is a personal favorite this season- and these elongated stars are not only crazy well-priced but also wearable and perfect. 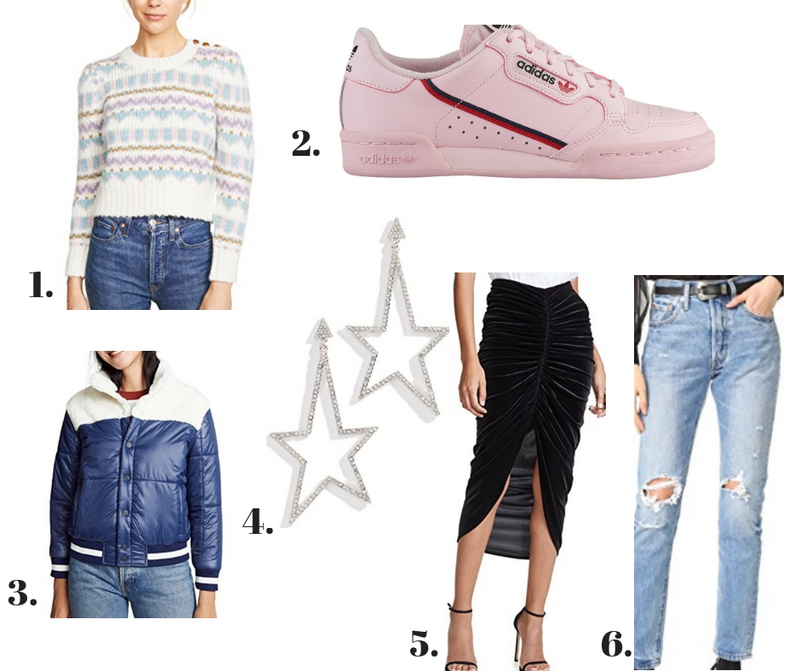 5: Bailey44 Any Seven Velvet Skirt: With a basic white t-shirt and a cropped denim jacket, and either sneakers or booties, this skirt feels like just the thing that makes a current season statement when worn with prior season staples. 6: Levi’s 501 Skinny Jeans in Old Hangouts Wash: Blame it on all the style bloggers I follow on Insta- but I feel like the one pair of jeans I NEED (and don’t have anything even close to) is a borderline-stonewashed, stiff pair of high-waist button fly Levi’s. Preferably these.